The revised Volkswagen Scirocco is available to order now, priced from £20,445 for the entry-level 1.4 TSI 125PS manual. The range is topped by a 280PS R version, priced at £33,795. First deliveries of the updated model are due in October 2014. 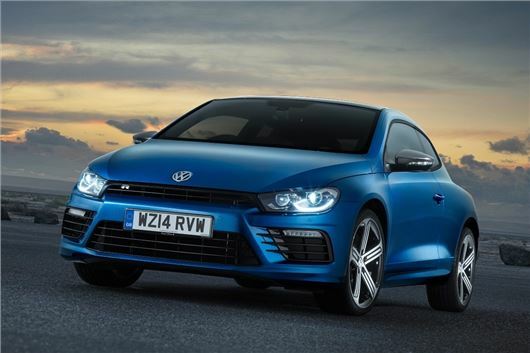 The subtle update gives the Scirocco styling akin to that of the latest Golf GTI. The bumpers, tail lights and headlights are more angular and the tail light clusters themselves are all-LED. The tailgate has been revised so the Volkswagen badge now functions as the boot release handle. There are four petrol engine options, kicking off with the 125PS 1.4TSI. This is joined by 2.0-litre petrol engines with 180PS, 220PS or 280PS in the top R model. Two diesel versions are available, both with a 2.0-litre capacity. Power outputs are either 150PS or 184PS. Four trim levels are available. Entry level cars get 17-inch alloy wheels, sports seats, touchscreen infotainment, DAB radio, air conditioning, auto headlights and auto wipers. Moving up to GT adds larger 18-inch alloy wheels, tinted rear windows, an improved touchscreen system and dual-zone climate control. Moving up to R-Line adds 19-inch alloy wheels, R-Line scuff plates, R-line steering wheel, carbon-look dash inserts and electrically adjustable, heated leather seats. The top R model gets unique exterior styling, xenon headlights with LED running lights, R-specific seats, lower suspension and dynamic chassis control.